So, I’ve been working on The Witch Queen’s War again. I had shelved it during NaNo last November, but I suddenly had some inspiration, and have about 5,000 words written down on it. I’ve also done a few sketches for my own reference, and figured I’d share a little bit. Tiernan’s seal. Not the best I’ve ever done, but it works. 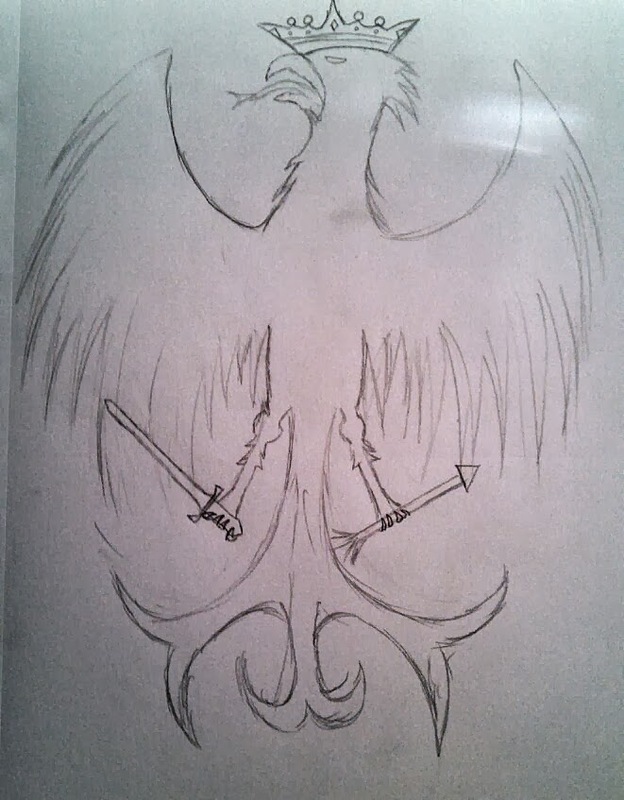 I used the Prussian eagle for a general reference. I know this will sound sudden, and I know that you will be far from pleased to read this, but I have nowhere else to turn; believe me, I have exhausted all other options. Sister has fallen ill. It began about a month ago now. Small things at first, nothing more than minor inconveniences. But things have progressed. She has become all but bedridden, and even that becomes more and more likely by the day. The Healers are mystified. They can find nothing wrong, and yet her health continues to decline a bit more every day. Please, Eirian, come home, if only for a time. I have a request for you that I don’t feel is proper to make any way less than face to face. I know that you and Gwen have had your differences, to put it lightly, but I beg you to put that behind you for now. Gwenlyn needs your help, and so do I. Please, Eirian. You know that I would never ask unless I didn’t think it absolutely necessary. I have instructed my messenger to wait for your response. Please hurry, Eirian. I need you to come home. Eirian would never forget the horrified look on her mother’s face when she had told the late queen about the noise, not matter how hard her mother had tried to mask the expression. After that, her Seniors, and everyone else in the palace, had begun watching her even more closely, as though they expected to walk into her bed chamber one morning and see a demon sitting in her place in the bed. Maybe they had. Eirian had heard them. Grown men, frightened of a child’s potential. So that’s what I’m working on right now. I haven’t forgotten about other things that I’ve started, like some more recommendations, but when I’ve got inspiration for my personal writing, I run with it.